With two new stadiums and the best events in the country headed our way, 2017 is a banner year for events in Atlanta! You don’t want to miss the inaugural seasons in these venues. Select a venue below to learn more. This season is the official housewarming for two of Atlanta’s home teams and we are excited to have access to the best suites on the market. Don’t miss out on that new suite smell! This once in a lifetime opportunity is an experience you don’t want to forget. As the first online marketplace for suites, SuiteHop offers live suite pricing and suite availability for Atlanta Falcons Suites, Mercedes Benz Stadium Suites, SEC Championship Suite Rental, Atlanta Braves Suites, SunTrust Park Suites, State Farm Arena Suites, Atlanta Hawks Suites and more. SuiteHop has planned over 500 corporate events throughout Atlanta and are your guide to navigating suite pricing and suite event logistics in the ATL area. Our team of suite event experts will help you with securing your suite, managing catering and distributing tickets. Choose the Atlanta venue you’d like to experience the Suite Life at and we’ll provide our expertise to locate a suite that is best suited to your budget and goals. 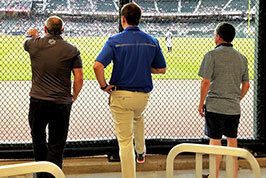 Want to learn more about hosting suite events in Atlanta? Fill out the form below or call us at 1-844-784-8346. We look forward to hearing from you! Copyright © 2014 - 2017 SH Suites, LLC. All rights reserved. Step into the action and experience Atlanta football like you never have before. 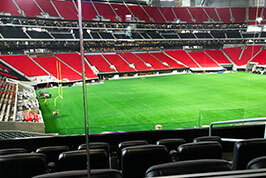 Field level suites provide end zone views of the field and seat 18-22 guests. There are only 16 of these suites available each game making these unique vantage points a premium location. 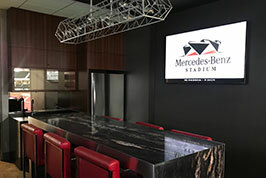 Loge Suites at Mercedes Benz stadium seat 4-6 guests and are a semi-private box located below the 100 level suites. Loge boxes include access to the AMG and SunTrust Clubs where guest will receive all-inclusive food and beverage throughout their event. 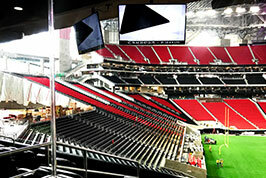 Located above the 100 level of regular seating, these Mercedes Benz Stadium luxury suites seat 16 - 22 guests. With in-suite restrooms, HDTV’s and Wi-Fi in suite, there is no better way to experience a game. Located above the 100 level, the Owner’s Level Suites at Mercedes Benz Stadium are the creme of the crop for luxury entertaining. With all-inclusive food and beverage, private restrooms and access to the Gullwing Club, these suites seat up to 20 guests. 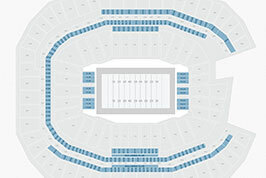 The Mercedes Benz Stadium 200 level suites are located in between the 200 and 300 level of seating and seat 18-23 guests. 200 level suite rental costs include access to a private space for your group to enjoy the event and private in-suite restrooms. 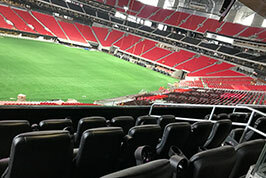 The gem of the Atlanta event locations, Mercedes Benz Stadium opens their doors this fall with unforgettable sightlines and incredible amenities. Home to the Atlanta Falcons, SEC Championship, Peach Bowl and Atlanta United this state-of-the-art venue will blow you away. 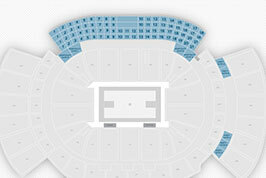 With access on all four levels of the arena, Executive Suites can seat 16-21 guests. Suite guests and club level seats are aligned in a grouping on one side of arena, providing exclusive access to premium concessions and VIP restrooms. 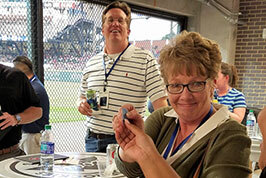 Located behind section 101 Hospitality Suites seat 8-24 guests per event and puts your guests in the heart of the action. 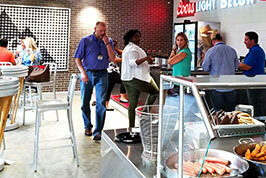 State Farm Arena Hospitality Suites come in two sizes, large seating up to 23 guests and small, seating up to 12. Ideal for hosting corporate events or family celebrations, State Farm Arena Party Suites seat larger groups and provide luxurious seating and VIP Parking passes. 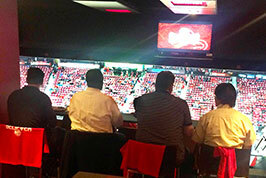 Guests in a State Farm Arena Party Suite receive access to the Georgia’s Own Credit Union Club during their event. 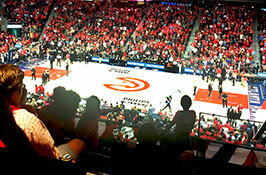 Newly renovated, State Farm Arena is home to the Atlanta Hawks and the prime stop over for the top concerts and bands coming through Georgia. 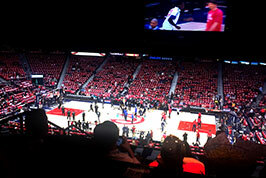 With more than 200 events per year, State Farm Arena suites stay busy year round. 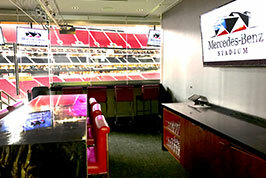 A total of 92 suites ranging in size from 8-24 guests provide an array of options for Atlanta corporate events. 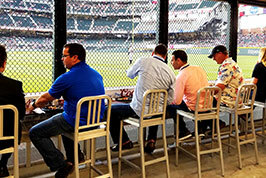 Located on the 200 level of the ballpark, Infiniti Club suites are best suited for small gatherings. With premium decor and access to the club level, most Infiniti Club level suites seat 12 guests with the ability to purchase additional tickets. With home plate views, the Champions Level Suites at SunTrust Park are the best sightlines in the ballpark. 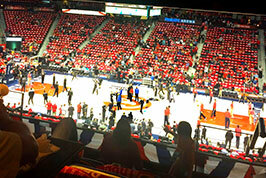 Champions Level suites seat up to 24 guests and feature premium decor, in-suite wetbar and access to premium catering. Opened at the beginning of 2017, SunTrust Park is the new home of the Atlanta Braves. During hot Georgia summers there is no better way to experience a ballgame than in the climate-controlled luxury of a SunTrust park suite. Suites at SunTrust Park are available in a wide variety of sizes, starting at 20 guests and going up to 250 for large corporate events. 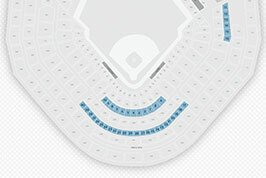 Find a suite for a Braves game!